@Zorba: No, that car could potentially power itself — if the wind happens to blow several times as fast as you want the car to go. But a simple sail would probably do the job much more efficiently than towing that generator. Of course, if the wind doesn’t happen to blow that fast for that long, forget it. Did you mean to write, “Simply stated, there are no success stories. And the reason they don’t exist is because Keynesian economics doesn’t work”? Did you mean to write, “Sort of like taking money out of your right pocket and putting it in your left pocket and thinking that you now have more money”? 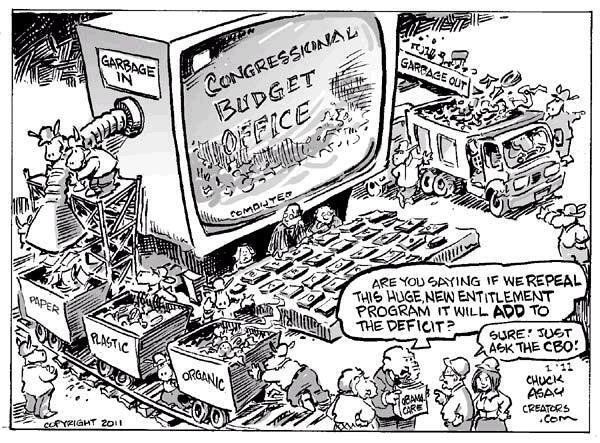 I just found this depiction that best captures the essence of Keynesianism. 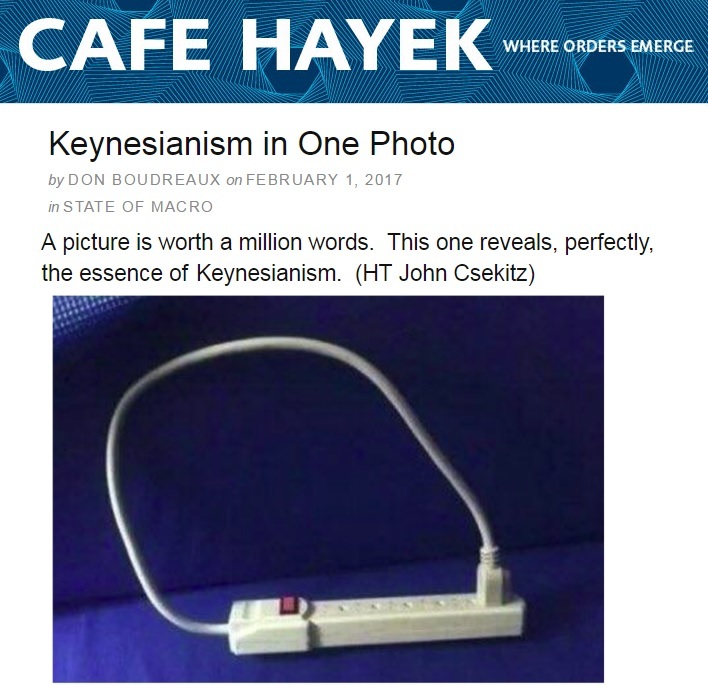 It was not made to depict Keynesianism but in my view captures it well. Now, to get a big into the physics of it, Keynesians (and probably some environmentalists also) believe that all this car needs is a small push and then voila! it perpetually accelerates. They will actually even debate the relative sizes of the car and the wind turbine in many Keynesian paper publications that will gain them economist fame. 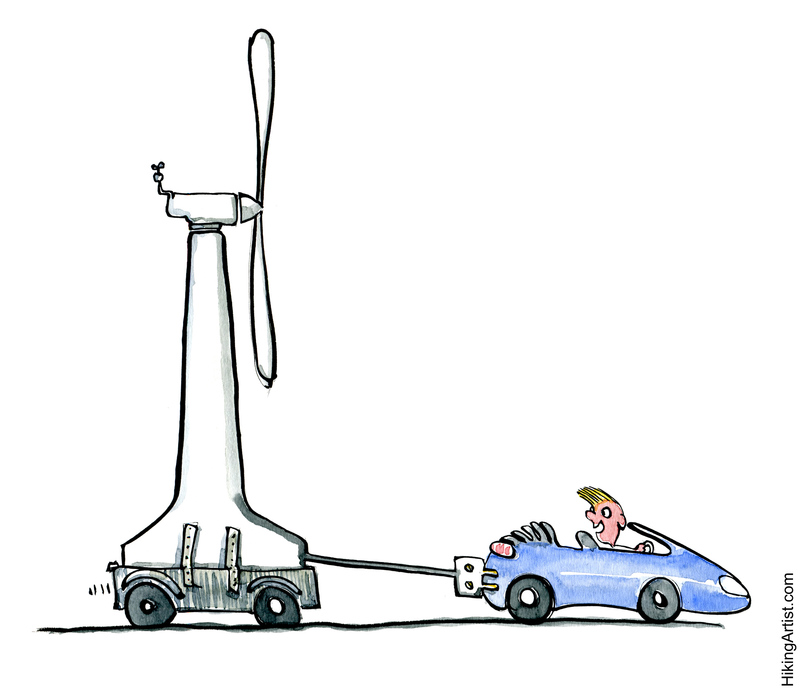 In reality, you have to keep pushing this car, no matter what you do — and actually push it harder than you would if you did not have the turbine in the first place! This is not even Keynesianism. Kaynes simply believed that left to its own devices, the economy exhibited deep boom-bust cycles which he thought government could smooth out with TEMPORARY interventions, like stimuli in recessions and tighter monetary policy in expansions. Keyes never implied that a country can achieve faster permanent structural growth through what is now been sold as perpetual government stimulus — that is, perpetually permanent big government. Therefore modern big government economic dirigisme goes much beyond the Keynesian suggestions when it comes to intervention and central planning. The modern big government espouses some sort of all out neo-perma-Keynesianism, whereby an economy can presumably be kept permanently hotter through perpetual stimulus. I think that even the limited temporary interventions Keynes advocated are actually wrong. I think that left to its own distributed wisdom “the market” would have internalized the boom and bust cycles and actors automatically would have start taking actions that smooth out the business cycle — especially after someone, like Keynes, had explained the inevitable periodicity of boom and bust cycles. Before business cycles were explained by Kayenes, people were more likely to believe that each bust represented the start of a permanent decline. Once the periodicity of the business cycle was explained by Keynes in the 1930s actors were poised to became more convinced of its cyclical nature, and would have started acting differently, internalizing the Keynesian explanations. E.g. If it is almost certain that the typical softening of housing prices that accompanies a typical cyclical recession is temporary, then, some investors start saving money to buy houses in the beginning of the next recession, to reap the benefits during the impending recover. That action, in itself, starts softening the depth of recessions. However…unfortunately, “the market” was never given much opportunity to internalize the newly explained business cycle. That opportunity for the market to self adjust was never given, because as soon as Keynes explained the business cycle, the opportunity for centralized economic planning intervention started in earnest. Ever since the macro-economic intervention that Keynes unleashed was implemented, “the market” has had to internalize and deal with not only the business cycle, but also the actions of a monopolistic cadre of central planners who try to counter it, i.e. the Fed, and other dirigistic centers of monopolistic economic policy authority. That adaptation is much harder to do, as the latest government engineered financial crisis also proves. The corollary is that Keynes would have been much better of simply explaining the business cycle and then refrain from assuming that interventionism, even temporary interventionism, was the answer, letting the market simply internalize his explanations and predictions on the business cycle. Not that politicians and collectivist voters would have listened to him, but at least he would have not contributed as much in promoting the new opportunity for more central planning intervention that directly derived from his theories. Besides, intervention likely entailed much more glory for Keynes himself. So, is Zorba smarter than Keyes to call him wrong? No, not any more than saying that Sir Isaac Newton, another incredibly intelligent human was ultimately wrong. He was wrong because a couple of centuries later, another incredibly intelligent individual, called Albert Einstein, armed with a couple more centuries of scientific work and data, as well as an overcapable brain, proved to Zorba and the world that Newtonian dynamics are just an approximation, that they are actually wrong at high velocities, and that these high velocities are actually quite common in the universe. But back to the issue where all prosperity ultimately derives from: Growth! I have to remind once again that any country that does not at least match average world growth in the longer term, is ultimately a country in structural decline. I also need to remind that longer term world growth in the past few decades has risen to about four percent! So, yes, dear Americans, that is the target for simply MAINTAINING the world prosperity rankings you have become so accustomed to — and, obviously, take for granted : About FOUR PERCENT annual growth is needed. Now, if you actually want to increase your world prosperity ranking then you may have go even a little higher than that. Many will reflexively say that it is inevitable that developed countries grow slower than less developed ones, and thus likely grow slower than the world average. This does not make sense. If that were the case, prosperity disparities amongst nations would always have a tendency to self cancel. And if that were the case, then how did the current large disparities arise in the first place? Some will say that the US has risen to the top of the world prosperity rankings without ever experiencing permanent structural growth rates above 4%. That is true, but it is because the US mustered structural growth rates of 3-4% at times when average world growth was half that or less. That era has forever been surpassed and four percent growth seems to be the new world average trendline for a few decades now — and accelerating like a hockey stick graph. So, if you keep up with that four percent growth rate you can at least maintain your prosperity rankings. If you do better than four percent, you increase your prosperity rankings. If you do worse than four percent you are in structural decline. Your country’s share of world GDP keeps shrinking. Yes, you are still growing in absolute terms (so long as you have any growth at all) but the world on average is growing much faster. If your growth rate is below the four percent world average, you and your country are on a trajectory whereby the things that you now consider unnecessary frivolous luxuries of some rich elite will become essential elements of a standard decent life in the future. And you and your country will not be able to keep up with that standard. Because those worldwide standards of decency are growing by the 4% world average, not a euro-like welfare state 1% growth average. At a -3% growth deficit the rising worldwide standards of decency quickly compound and sink you into the wretched relative poverty of the next century (or, actually, sooner, mid century will be enough for Europe, a couple of decades longer for the US on current trajectory). But it is possible for a small government, that is, steep effort-reward curve motivated modern developed nation to actually have growth rates of four percent, even a little higher. See Rahn curve. So how are we, Americans (both native and immigrants to include myself) doing on that growth metric? Well, our structural growth rate is now 2% after eight years of HopNChange. Our structural growth rate is, HALF the average world growth trendline. So we are firmly on the structural decline trajectory. Neither is that going to change any time soon. Growth is suppressed by the TOTALITY of accumulated regulations and redistribution imposed on a nation by governments, not only the current government but, especially, past governments. In other words, growth depends on the cumulative regulation and redistribution burdens placed on a society, not the rate at which these regulations and redistributions are been dismantled or augmented. In that sense, while the rate at which Trump may dismantle regulations and redistribution is ultimately important, such a rate has little impact on current growth. Growth is still suppressed by the totality of accumulated redistribution and regulation past. So consider for a moment all of Trump’s near term executive orders; current and those in the near term pipeline. At best, they amount to rolling back a mere five percent of the regulations and redistribution imposed during the eight year Obama Democratic rule — not to mention that some of Trump’s orders and plans are outright statist thus at least partially negating his good policies. The Trump rollback is a drop in the bucket in terms of what is needed. To get to that four percent growth that will allow our children to maintain their American standard of living worldwide ranking, Trump would need to roll back all the accumulated Obama statism, all the Bush statism… all the way back to perhaps Reagan. That is when a structural Growth trendline of four percent or above will return. What is the chance of that happening? It may have happened if we had elected a libertarian administration back in 2008. Then, there was still a small chance — and we blew it — blew it royally. Yes, we got the moral satisfaction of electing the first black president (BTW, he is half white so I’m not sure why people concentrate on his blackness) but in exchange sealed our ultimate fate to becoming a euro-style one percent growth trendline to decline nation. So what are the chances of a sufficient enough rollback? Consider for example Obamacare, one of the main vehicles to welfare state serfdom and structural euro-style one percent growth. I had warned back in 2008 that such a move was irreversible. I warned that at best a future republican administration might primarily just repair and rename it. There is absolutely no way that we could return to a system whereby a person is responsible for becoming productive enough at some point in their lives to earn the money needed to cover his/her lifetime health expenses of modern medicine. The new regime, whereby a person can offload these expenses to someone else through the ballot box is here to stay. That is just the nature of entitlement programs. And that is the nature of the reduced incentives to productivity they precipitate. So, you realize the truly daunting task of returning to four percent growth, and thus have our children retain past midcentury the exceptional American prosperity ranking we are accustomed to. My advice remains: Keep mobile. Especially, teach your children to be so. In the long term it’s the most impactful skill you will ever learn. Remember, surprises, incredible surprises, are in store for the future. Don’t you already feel the surprise trendline accelerating? Keep mobile! The argument against Keynesian stimulus sounds similar to the argument against Daylight Savings Time. You don’t make a blanket longer by cutting a foot off one end and sewing to the other end.